We all know very well that currently, most of the smartphones that are on the market have a SoC manufactured by the well-known giant chip manufacturer, of course, I am talking about none other than the Qualcomm. Hence, now according to the latest reports, today we will show you the world’s most powerful AI-based processor for 5G smartphones. Currently, most of the smartphones that are on the market have a SoC manufactured by the well-known giant chip manufacturer, of course, I am talking about none other than the Qualcomm. Yes, the well-known giant chip manufacturer Qualcomm’s Snapdragon line has been there in the market over the last 11 years and equipped more than one billion smartphones which is a huge and unique evidence of its quality. Continuing what Qualcomm’s Snapdragon line has made available, and maintaining its technical experience and quality, the well-known giant chip manufacturer Qualcomm has now come to show its next plan. Yes, I am talking about the next processor, and it will be none other than the Snapdragon 855, as it will be the protagonist and will equip the flagship smartphones next year, of course, 2019. As recently, the well-known giant chip manufacturer, of course, Qualcomm just unveiled the SoC that will be the company’s next proposal for the world’s top Android smartphones. The Snapdragon 855 comes on the market with many new features and many extraordinary technologies. The specifications of this new flagship SoC are not yet known, but the giant chip manufacturer Qualcomm has lifted its curtain a bit and has shown the world what it has been preparing for the next year 2019. However, the most important is the arrival of the 5G smartphones, the door being opened by this SoC and its modem Snapdragon X24. This new SoC of the giant chip manufacturer, of course, Qualcomm’s Snapdragon 855 will be manufactured in 7nm technology, something that the competition has already achieved a few months ago, with the well-known Chinese smartphone manufacturer Huawei debuting this process on Kirin 980 and the tech giant Apple on its A12 Bionic. In the field of Artificial Intelligence, the Snapdragon 855 brings the 4th version of Qualcomm’s offer in this area. As the company itself, of course, I am talking about none other than Qualcomm who promised a performance 3 times higher than its predecessors, while the presence of Computer Vision ISP also improves photography and video as well. 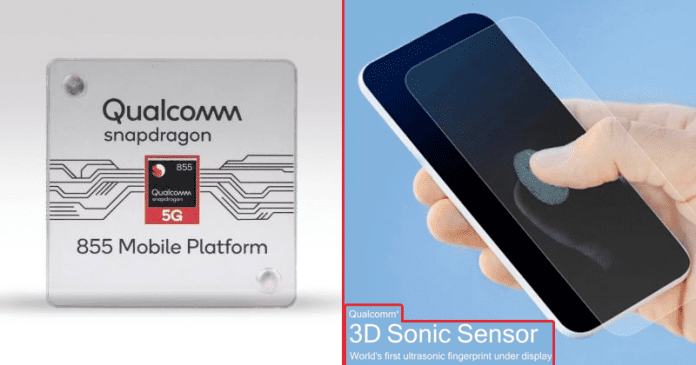 But, apart from its performance and 5G support this new Snapdragon 855 SoC will also have an extraordinary feature, yes, this new Snapdragon 855 SoC will come with the new 3D Sonic Sensor, the world’s first ultrasonic fingerprint sensor which will be equipped under the screen that will simply identify users’ fingerprints more securely. It is expected that in the coming months the first smartphone based on the Qualcomm’s Snapdragon 855 will arrive and at that time the real benefits of this new SoC from the giant chip manufacturer, of course, Qualcomm will be known. So, what do you think about this? Simply share all your views and thoughts in the comment section below.